It's been a busy year at Blog Appetit. My backlog of recipes and posts grew longer as my commitments to other projects grew. A lot of my recipes reflected my interest in international Jewish cuisine (although you don't have to be Jewish to enjoy them). Surprisingly for someone who doesn't bake all that much, a lot of my posts had to do with something sweet from the oven. 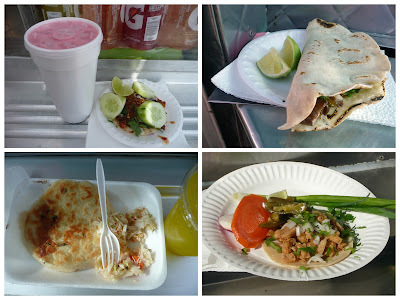 Here's some of what I thought was the best of 2010 from recipes and photos that did make it to the blog. I look forward to 2011 and getting to publish some of the wonderful recipes I haven't had time to post yet as well as creating or discovering new ones. 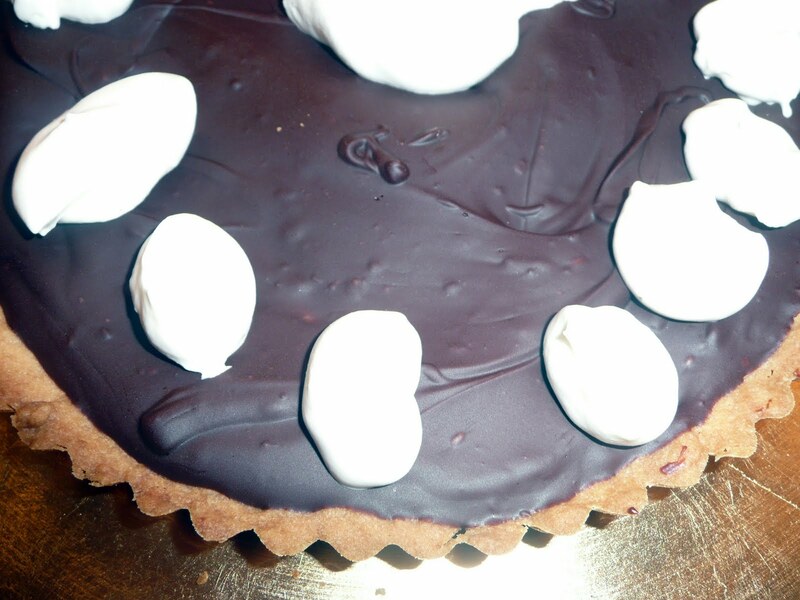 The winner for January was the wonderful chocolate tart I made for New Year's. You can read the post and find the link to the recipe for Bittersweet Chocolate Citrus Tart with Jasmine Tea Scented Whipped Cream here. From the post: "I rang the New Year in with friends and this bittersweet citrus chocolate tart from Alice Medrich's book Pure Desserts. The book should be called 'Perfect Desserts' because that's what this tart was -- the dark bittersweet chocolate offset by the grapefruit and orange zest and the wonderful jasmine-scented whipped cream just adding to the wild party in my mouth." Other recipes from the month featured a sweet and sour baked fish and a slow-cooked chick pea and lentil soup. Baby, it was cold outside and my blog featured recipes to warm you up, including some energy efficient baked apples. My favorite for February was a toss up between two noodle dishes -- a sweet noodle pudding and a savory pasta dish. 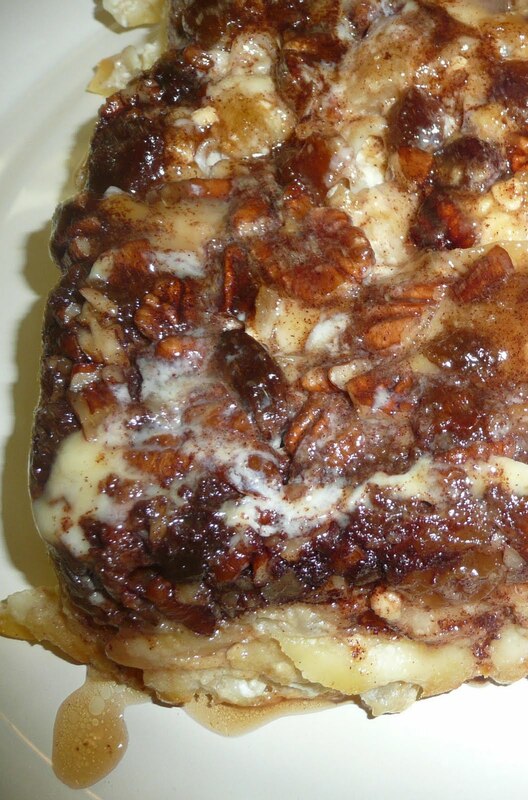 Far and away though, folks loved the sweet Cinnamon Bun Kugel from this post. This kugel is better as a brunch dish or dessert than a regular entree. Both it and my Baked Fidellos Tostadas with Sephardic Flavors are in the same post, so if you want to try the savory as well as the sweet, the recipe is there, too. My friend Karen Bloom also shared some of her never fail kugel-making tips, so check it out. The sweet kugel recipe was based on one developed by Nina Yellin, Karen's cousin, who has written a series of self-published cookbooks on kugels and similar dishes. My New Orleans Bread Pudding wins by a nose over the baked chicken and bread casserole I featured in the same post. 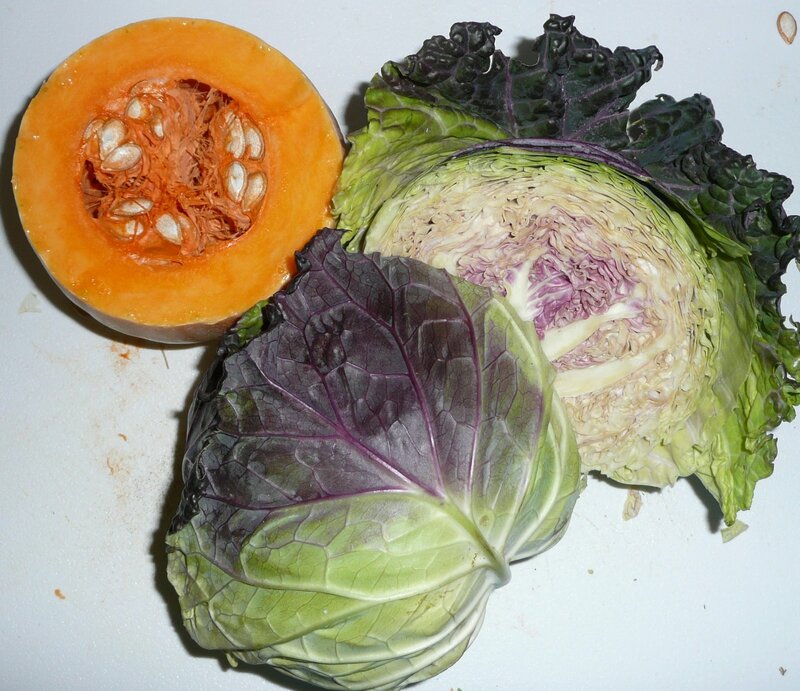 Also included is a tasty recipe for a soup with winter squash, greens and bread. Perfect for the cold rainy weather we are having right now. I end up creating recipes to use up bread all the time. It seems like I always have some extra crusts, slices and frozen hot dog rolls around. My favorite breads to use are challah or other rich egg breads for desserts and french toast or sturdy artisan breads for main courses or soups. March also brought posts on a gluten-free Passover menu (including pistachio lemon bars) and two other Passover recipes, one for Italian potato gnocchi, the other for a custard fried matzoh. April is the month where I seemed to go for monochromatic baking -- black and white cookies AND whoopie pies. I also remember not being able to stop eating my honey butter caramel sauce and my Moroccan eggplant conserves (not together, though), but I think my favorite recipe of the month was my oven-fried chicken. The chicken, which is oven fried without its skin, is juicy with a crunchy outside and is nicely seasoned with Middle Eastern spices. I served it with a honey-mustard slaw (that recipe is also posted). The chicken also has one heck of a back story involving suspicions of drug dealing. For more on that and the recipe, click here. These are not your mother's Rice Krispies bars. You could replace the Kashi cereal here with granola (see Gary's recipe here) or other ready-to-eat cereal. 1/4 cup butter,plus extra for greasing pan. 4 cups of regular or mini marshmallows (about 7-8 oz). Grease a 9"x12" or 9"x13" pan. Melt 1/4 cup butter over low heat in a large saucepan. Add marshmallows and stir until completely combined and smooth. 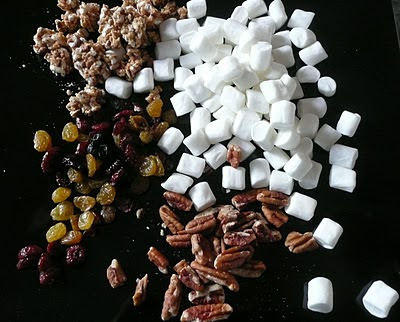 Remove from heat and stir in cereal, pecans, dried fruit and cinnamon until well combined. Turn out into greased pan. Cool until firm and not tacky to the touch. Cut into bars. Melt chocolate over double boiler or in microwave. Either drizzle chocolate across top of bars or spoon into large plastic storage bag with "zipper" style closure. Squeeze air out of bag and seal. Snip off corner of bag and pipe chocolate over top of bars. 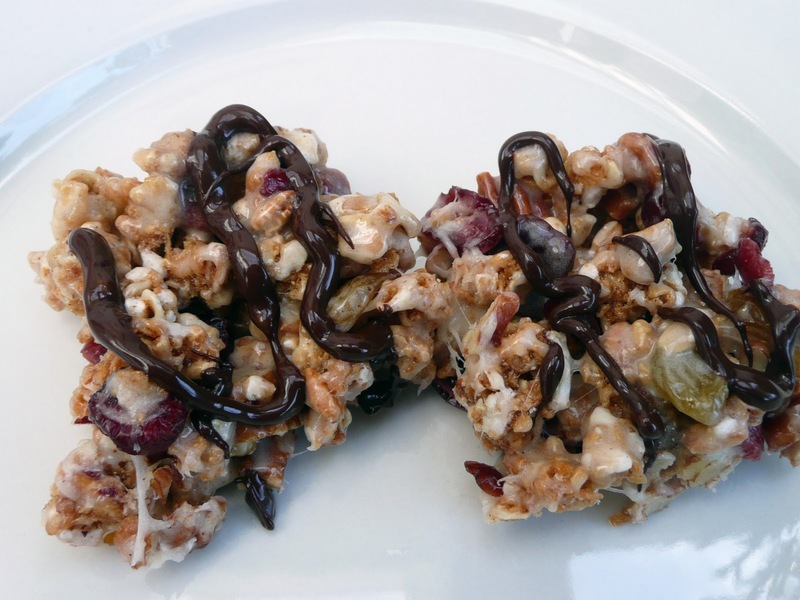 Here are other dessert recipes from Kashi using its cereal products. Interested in other alternatives to the classic rice krispies treat? Check out Smitten Kitten's excellent peanut butter and choclate version or salted brown butter variation. Don't You Wish They All Could Be California Kugels? Tonight's the last night of Chanukah and perhaps you are a wee bit tired of foods fried in oil, chocolate coins and sugary jelly doughnuts. Then you may want to celebrate with something made with cheese or milk, since eating dairy foods is another holiday tradition. Or if you don't celebrate Chanukah (aka Hanukkah), maybe you are just looking for a good brunch, lunch or light dinner dish that you can make ahead. Whenever you serve it, this noodle pudding (kugel) is delicious. Chock full of California fruits and crunch, this kugel is a riff on the popular frosted flakes or cornflake kugels I’ve eaten. It’s got lots of texture, is not overly sweet and has a creamy custard with a hint of spice and lemon. Pick a granola with some dried fruit and nuts for the best results. Store bought is fine, but if you’d like to try making your own, check out my husband’s granola recipe. Like most noodle kugels, this one is a bit on the rich side. I’ve tried to compensate by using lower-fat dairy products where I could. Also, the large baking pan makes for a little thinner kugel. Use a 9” x 12” pan and bake a bit longer if you prefer a thicker noodle pudding. Note: If your raisins and dried apricots are not moist, soak in hot water for 30 minutes or until softened and drain before using. Prepare noodles according to package directions. Drain and mix hot noodles with 2 Tbs. of butter. In a large bowl, mix 2 Tbs. of the melted butter with the eggs, sugar, salt, nutmeg, cinnamon and lemon zest until well combined. Beat in (an electric hand mixer works well) cream cheese, sour cream and milk until the mixture is fairly smooth. Add buttered noodles and mix well. Add in raisins and chopped apricots; stir until the dried fruit is evenly distributed. Pour mixture into a greased 9” x 14” pan. Toss the granola with the remaining melted butter and spread evenly over the top of the kugel. Chop remaining Tbs. of butter into small bits and scatter across the granola topping. Bake for 30-35 minutes until the custard is set and the top is browned. Serve hot, warm or at room temperature. 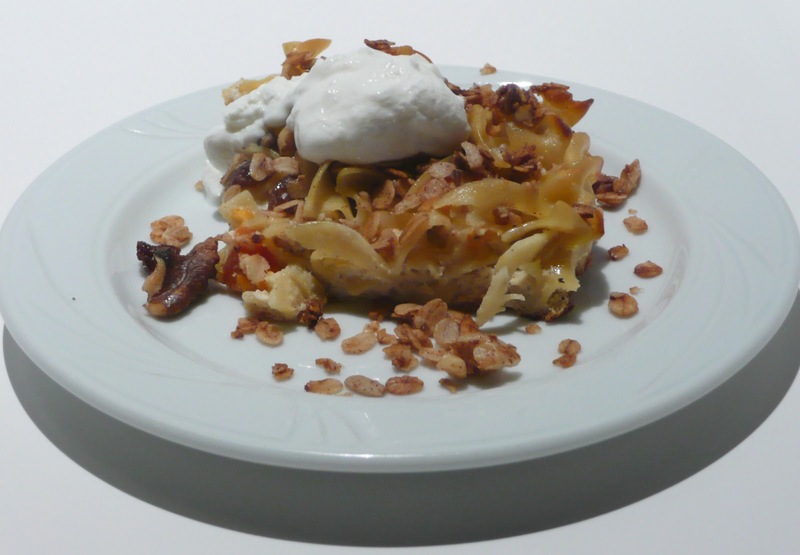 For my savory dairy-free kugel and a decadent cinnamon bun kugel, please check out this post. This recipe appeared in another context in the Temple Beth Abraham newsletter, the Omer. Did you attended my talk today about Chanukah Foods Around the World and not get a copy of the handout or want to see the online copy? Please click here for the Google Doc version. If you weren't able to attend and wanted to see the handout, feel free to click on the link as well. I will be updating it shortly with additional recipes. 12/9/10 -- I've updated the handout with another recipe and links to others. Enjoy. They look so great and I'm so proud of him, he's never made anything like this before or even attempted any major frying. FYI - Did you know that there are 16 recognized spellings in English for the name of the Jewish winter holiday? According to the BlogCatalog these are: Hanukkah, Chanukah, Hanukah, Hannukah, Chanuka, Chanukkah, Channukah, Chanukka, Hanukka, Hannuka,Hannukkah, Channuka, Xanuka, Hannukka, Channukka, and Chanuqa. ﻿ Let me make one thing perfectly clear. I don't take to quick and easy latkes. 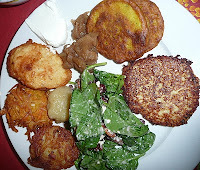 No potato pancake mixes here at Blog Appetit. My favorite recipe for latkes includes grating plenty of spuds. (You can find that recipe here.) But, well, sometimes there just isn't time or the ability to grate the potatoes and that's when Shortcut Latkes really shine. Fried crisp and fresh they are almost as good as the real deal. Perfect for a weeknight Chanukah meal, or as a light entree or side dish any night. So take a gamble and give these quicker potato pancakes a spin (see note below). I used the Simply Potatoes brand. Use them right out of the fridge for best results. (The colder the mixture, the less likely the pancake will fall apart in the fry pan.) For a milder latke, use the lesser amount of onion and leave out the garlic. 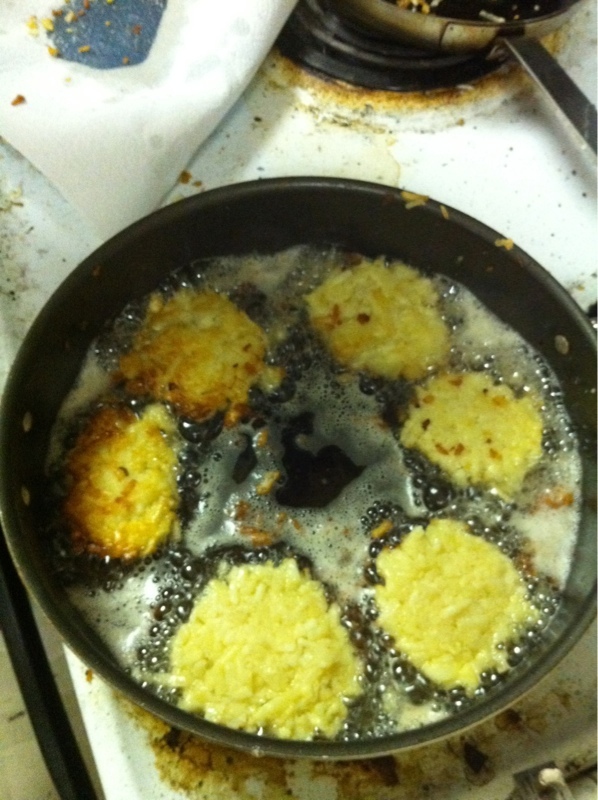 My 19-year-old son made a batch for his first-time ever latkes. You can see a photo of that here. Note: If you can only find the frozen pre-shredded, please thaw and drain before using. Beat the eggs in a large bowl with the pepper and salt. Add potatoes, onions and garlic. Mix well. Add cake meal or flour. Mix well. Heat ¼” oil in a large fry pan over medium high heat. Form patties about 3” in diameter and ¼ to ½” thick. When a bit of batter put into the pan sizzles, slide 3-4 patties into hot oil, being careful not to crowd pan. Press down on pancakes with spatula occasionally as they cook. Fry for 2-3 minutes on each side until brown and crispy. Remove to paper-towel covered plate. Add more oil if necessary and allow to come back to “sizzle” before frying next batch. Repeat as needed. Keep warm in a low (200 degree) oven if desired. Serve with applesauce and/or sour cream or plain yogurt. 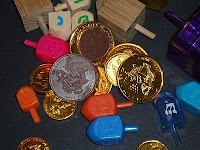 Note: Re the photo and gamble/take a spin -- a little pun about the dreidels and gelt in the photograph. 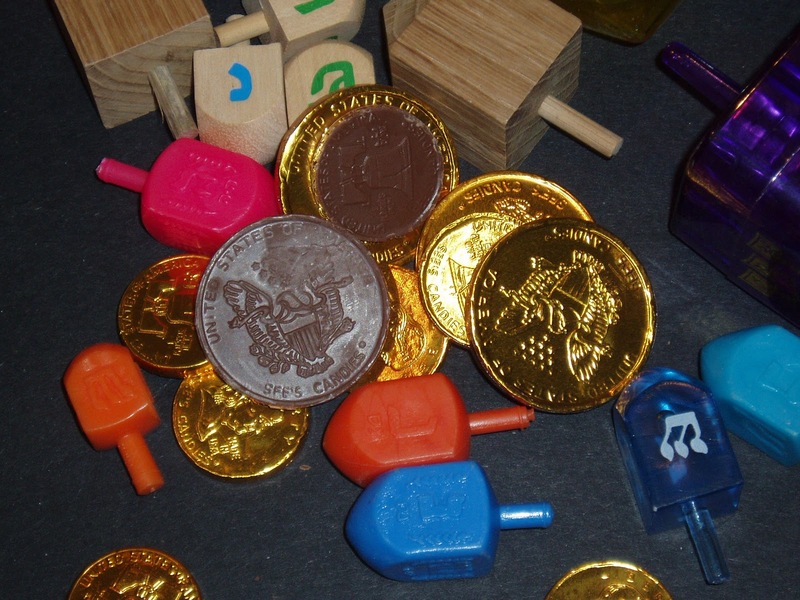 A favorite game of Chanukah (sometimes spelled Hanukkah), it involves spinning a top and seeing where it lands. Gelt, originally money now usually chocolate coins, is wagered on the outcome. For more on the game and its rules, please click to this post for directions, suggestions and even a paper template to make your own dreidel. ﻿﻿﻿ Come to an adult Chanukah (or Hanukkah if you prefer) party, 7 p.m. this Thursday, December 2nd at the Jewish Community Center in Berkeley. After candle lighting join one of four hour-long talks about Chanukah, including mine about Chanukah foods from around the world. Everyone gets back together at 8:20 p.m. for chocolate and port. I've been doing my homework and will have a presentation as jam packed as a sufganiyah (Israeli Chanukah jelly doughnut) full of Chanukah foods past and present as well as a handout of some recipes to for some take home exploration. I'll be covering Chanukah foods from apples to zvingous and a whole lot of tasty treats in between. Admission is free and open to all, but you must be 21 or older. The Jewish Community Center of the East Bay is located at 1414 Walnut Street in Berkeley. 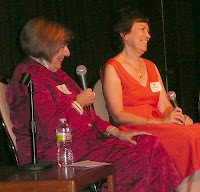 The event is sponsored by the JCC of the East Bay, Building Jewish Bridges, Oakland Ruach Hadassah and Berkeley Hadassah. Go to the JCC website for more information. 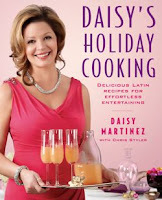 I don't think I would have looked at Daisy Martinez's new cookbook for fall and winter holiday entertaining except that my sister is a big fan of the TV chef. Since I didn't really know Martinez's work or food, I was pleasantly surprised by the wonderful Latino and Hispanic flavors her recipes offered and enjoyed the snippets of her life she shared. 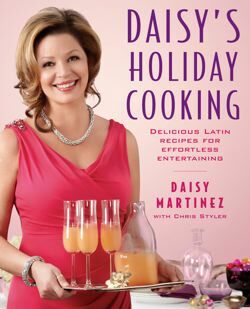 "Daisy's Holiday Cooking: Delicious Latin Recipes for Effortless Entertaining" with Chris Styler (Atria Books) is menu based and includes preparation schedules to help reduce some of the stress of cooking these "major" meals. Between the recipes and the color photos I ended up drooling over almost every recipe in the 163-page book. They all seemed like they would be delicious. The 10 menus begin with a "cozy festive fall dinner" and end with a New Year's Day "linner" (mid afternoon combo of lunch and dinner). In between there are holiday buffets, Christmas events and an elegant New Year's Eve dinner. Each meal has its own color-coded section making it easy to find. The recipes are accompanied by lots of color photos for inspiration. While there are many recipes that would work well for vegetarians this is a meat centric cookbook. It is also Christmas centric, with no options for other winter religious or cultural celebrations. That's not surprising, since it is a food memoir of Daisy's own tastes and experiences, but it dimmed its appeal for me as a seasonally based cookbook. However, most of the recipes would be appropriate throughout the year, so the book is not limited to holiday cooking. An index by course would have made it easier to use the cookbook year round and increased its versatility. This is special event cooking, so don't expect budget cooking or super-quick recipes, although Martinez does include easier variations to get the same flavors. Directions are thorough and complete with step by step photos of many techniques such as how to cut up a chicken and Martinez gives ideas on how to use up any leftovers. Some of the recipes that caught my eye include Achiote-Rubbed Roast Turkey with Manchamanteles (Tablecloth Stainer Sauce) with a chile-fruit note; Pumpkin-Spice Mantecadas, delectable little muffins; Empanaditas with Huitlacoche, Spinach and Mushroom Filling, small, savory turnovers using corn fungus; Arroz con Pato, a duck variation on a popular chicken dish; Coconut Tapioca with Mangoes, a luscious dessert, and Tamarind Margaritas, with spicy salt rims. Keep reading for the recipes for the Coconut Tapioca with Mangoes and the Tamarind Margaritas and for links to other recipes from the book. My apologies, for some reason Blogger hiccupped and my front page posts are now all in capsule form with only thumbnail photos. I hope Blogger will fix whatever it did asap. (Although, I'm nearing a month without the navbar search at the top of the page working right). I have changed nothing so I am clueless why this has happened. If you are reading this and you are seeing full posts, this means Blogger has fixed it, so never mind. Update: Seems to be okay now, but in case it reverts you know why (kinda). I'm looking forward to eating at Italian Colors tonight, which will be donating 10 percent of its proceeds to the Alameda County Meals on Wheels. Other Bay area restaurants will be doing the same. It's not too late to join in. Here's my post with more information. Or go to http://www.dineoutnow.org/ for more info. When I write my j. weekly column, the most frequent feedback I get is on recipes that are easy to prepare but offer something a bit different for entertaining. 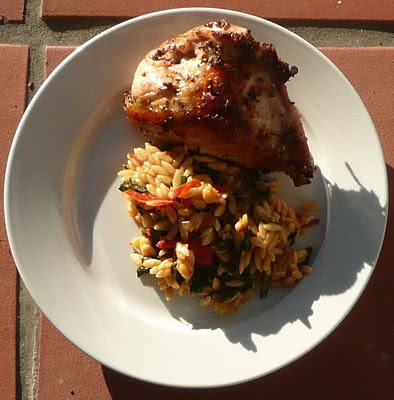 This Greek-inspired oregano and lemon baked chicken (with side dishes of leek-mint fritters and orzo with tomatoes and greens) seemed to strike a cord with readers recently. I developed these recipes after talking to Nora Rousso, the proud inheritor of many northern Greek Jewish food traditions. 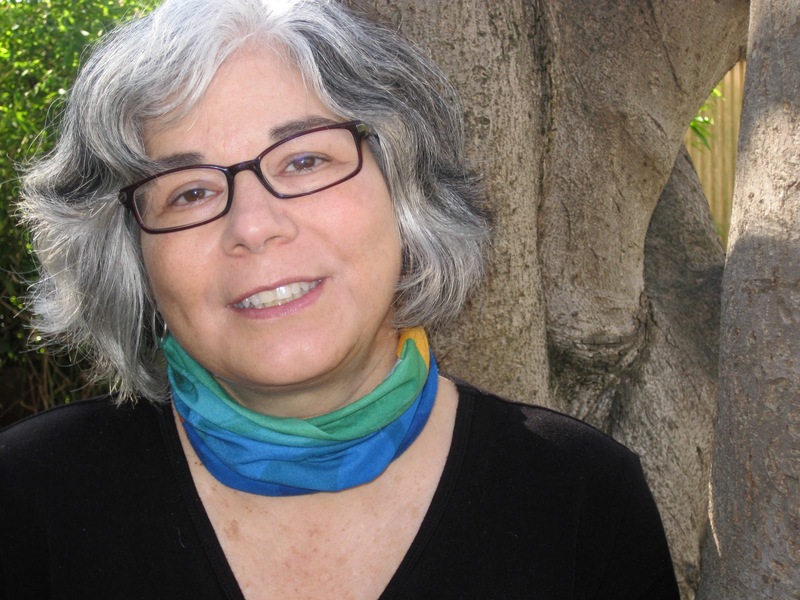 The Los Gatos resident can trace her heritage back to the Ottoman Empire and the fabled Sephardic city of Salonika. From her grandmother, mother and aunt she learned to appreciate and cook recipes that resonate with meaning for not just her family, but for many others who share a similar heritage. On holidays, her grandmother might make small homemade noodles called “fideos.” Normally boiled in water, for special occasions the noodles would be cooked with chicken broth and stewed tomatoes. Rousso says the traditional cooking she grew up mostly relied on salt and pepper for seasoning but that chicken was always baked in olive oil, lemon juice and “a ton of oregano.” She also has found memories of horta, a dish of cooked greens, usually dandelion greens with lots of lemon and olive oil. Based on Rousso’s memories, I’ve put together a Salonika inspired meal. My j. weekly write up is here. I’ve added some mint for the fresh taste and bright green color as well as a dash of crushed red peppers. 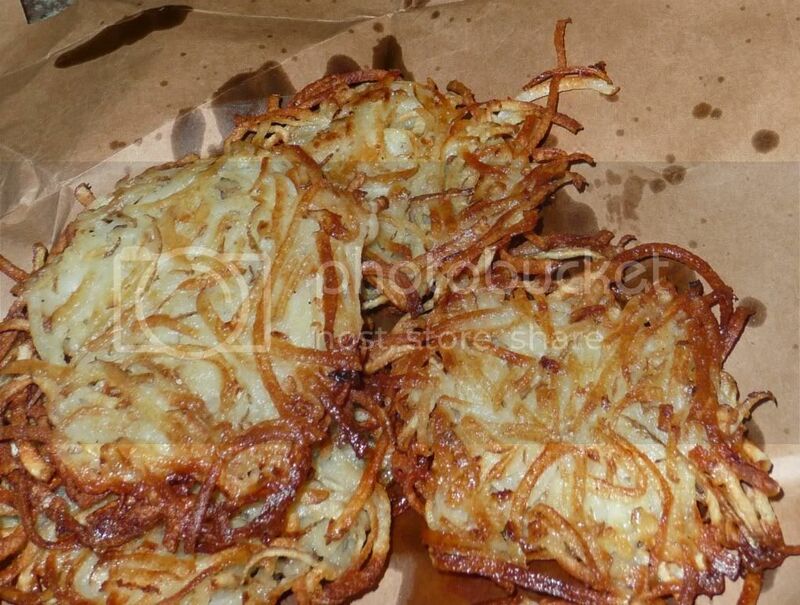 They would make a nice variation from potato latkes (pancakes) at Passover as well. I enjoyed the leftovers drizzled with tangy Greek-style yogurt the next day. Trim, cut leeks and half lengthwise and clean. Place in boiling water and cook until softened. Drain and cool. Finely chop by hand or in a food processor. Combine with garlic, salt and peppers. Mix well with beaten egg. Mix in matzoh meal and mint. Let batter rest 5 minutes. Stir and drop by ¼ cupfuls into hot oil over medium high heat in large fry pan. Fry about 2 minutes on each side or until golden brown. (Do not crowd pan). Remove to paper-towel lined plate and serve warm. Cutting back on the oregano to 1 tsp. gives a much milder oregano flavor if you prefer. In a large, non-reactive container, combine lemon juice, oil, water, peppers, salt, oregano and garlic. Mix well. Add chicken, turn to coat and marinate for 1 hour. Preheat oven to 450 degrees. Coat a large roasting or baking pan with oil or oil spray. Place chicken bone down in pan. Pour marinade over top of chicken. Roast, basting with pan juices every 10 minutes or so, until chicken is done when you cut into it and there is no pink at the bone but meat is still very moist. (Timing will vary depending on chicken part and thickness, a very thick chicken breast took 45 minutes.) Remove from oven, let sit 10 minutes. Serve with pan juices. I combined several of Rousso’s food memories for this dish. It makes an excellent side dish for the baked chicken recipe. I used dandelion greens, but for a milder flavor Swiss chard works, too. In a large sauté pan over medium high heat, heat the oil. Sauté onions until light brown. Add garlic, sauté until golden. Add tomatoes and sauté until just beginning to soften. Add in greens and remaining salt and pepper. Sauté until greens are tender (adding a bit of water if needed), about 10 minutes. Mix in cooked orzo and any leftover cooking liquid. Turn heat to low and cook until well combined and all liquid is absorbed. Taste. If the greens taste too bitter, add the sugar. Add more salt and pepper if needed. Serve warm with lemon wedges to squeeze over individual portions. 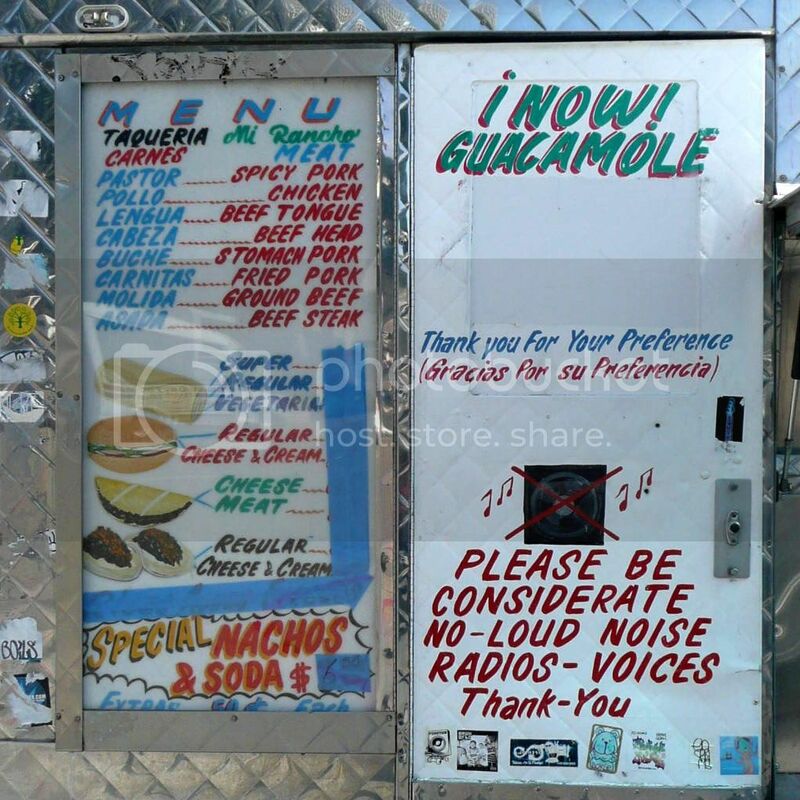 My friend Anna Mindess has a wonderful new blog all about ethnic food adventures east of San Francisco Bay. East Bay Ethnic Eats is a tasty read no matter where you live. 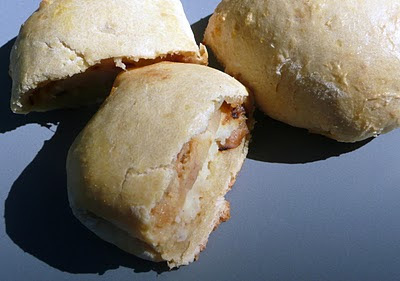 Anna is a wonderful writer but doesn't "do" recipes, so I offered to supply one for her post on handmade filo dough (Oakland's Oasis Market). You can read about how this wonderful dough is made here and see my baklava recipe there. 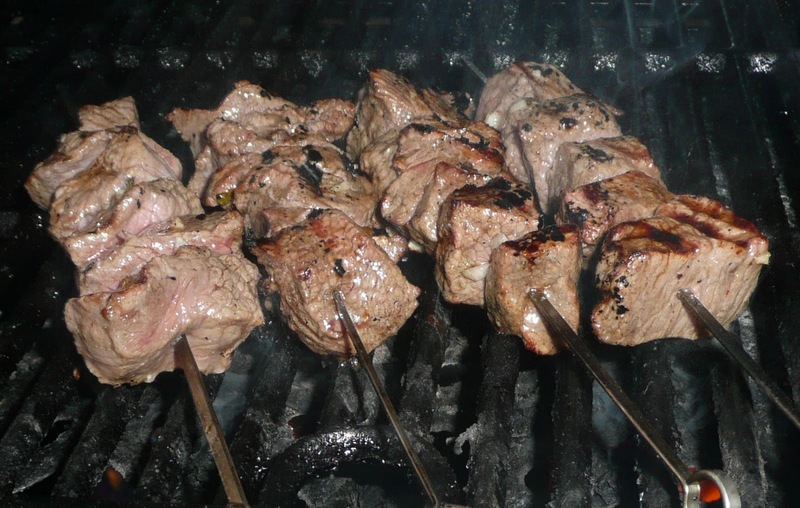 An Old Testament (Torah) bible passage inspires a hospitable menu of quick steak kabobs, barley cakes and yogurt and honey. The barley cakes are wheat free; the yogurt is dairy free. A man sits under some trees and spies three strangers and begs of them to partake of his hospitality. He asks his wife to quickly make some cakes out of the choicest flour, he tells his servant to kill a calf and prepare its meat and he brings his guests refreshing curds to eat. It is this passage in this week’s Torah portion from Genesis (Bereshit 18:1-22:24), known as Parshat Vayera, that is the basis of the mitzvot of hachnasat orchim, or welcoming guests. Abraham’s actions are even more remarkable in that G-d has appeared before him and he must turn away to offer the strangers succor. This portion fascinated me for several reasons. The first was the importance of the act of hospitality. The second was practical. Killing and butchering a calf doesn’t seem like my idea of a quick meal these days. The third was historical. What kind of cakes would Sarah have made with her choice flour? How would the meat be prepared to cook quickly? Based on this parshat, I’ve put together a menu that reflects some of the above. The recipes are all relatively quick to make. The cakes Sarah made were probably a form of flat breads or quick breads made of barley flour. Cutting the beef into small cubes reduces cooking time. As for serving curds with meat, the laws of kasruth now prohibit that, but a dessert of non-dairy vanilla yogurt drizzled with honey and sprinkled with chopped dates and nuts would be just as satisfying. A version of this post first appeared in the j. weekly. Here's the link to the column there. If desired make additional marinade and use it to marinate sliced zucchini or other vegetables for the grill. Serve the kabobs with quick-cooking couscous and the barley cakes. Note: If using bamboo or wood skewers, soak in water for a half hour before using. Preheat broiler or grill. Thread the steak on 4-6 skewers. Place under broiler or on medium high grill, basting with the reserved marinade and turning occasionally until cooked to desired doneness. Serve on or off the skewers. Sprinkle with parsley. These round quick breads have an earthy, satisfying taste. Barley flour is available in many natural food stores and on line. In a large bowl, mix the flour and salt. Drizzle in olive oil and water, mixing continually. Continue to mix (or use hands) until a dough forms. Working with your hands, knead the dough in the bowl for 2 minutes until smooth. Cover with damp cloth and let rest 30 minutes. Separate dough into 8 balls then flatten and pat each into a rough disk about 2-2 ½ inches in diameter and about ¼ to ½ inch thick. Heat vegetable oil in a heavy fry pan over medium high heat. 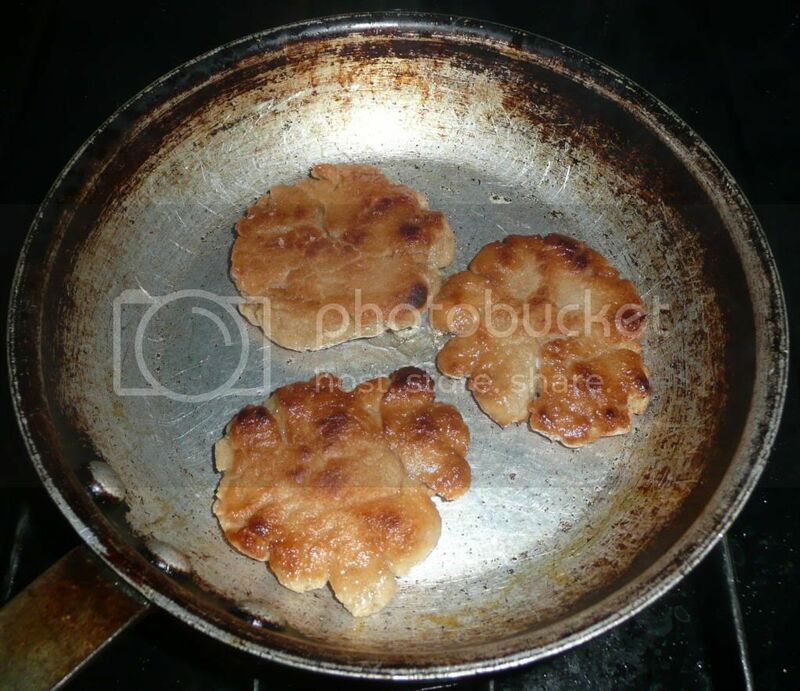 Fry cakes 1-2 minutes on each side, adding additional oil as needed, until lightly browned on both sides and cooked through. Because of Jewish dietary laws, this recipe uses non-dairy yogurt, but if you'd like substitute regular yogurt. To keep it vegan, use the non-dairy and drizzle with maple or date syrup instead of the honey. Place about ¾ of a cup of yogurt in each serving dish. Drizzle each serving with the honey, sprinkle with ¼ of the dates and chopped nuts and scatter ¼ of the mint over top. We like our fright with a bit of delight over here at Blog Appetit, so here's a round up of pumpkin and other Halloween appropriate food. From pumpkin pies to pumpkin-based main courses to caramel and candied apples, we have lots of options for a spooktacular holiday. This tamale-stuffed pumpkin would work well for Day of the Dead parties as well as for Halloween repasts. I used some of Primavera's wonderful gourmet tamales, but you could use any kind of cheese or, better yet, cheese and chile, tamale. Blog Appetit offers up several kinds of pumpkin pies for your eating pleasure. 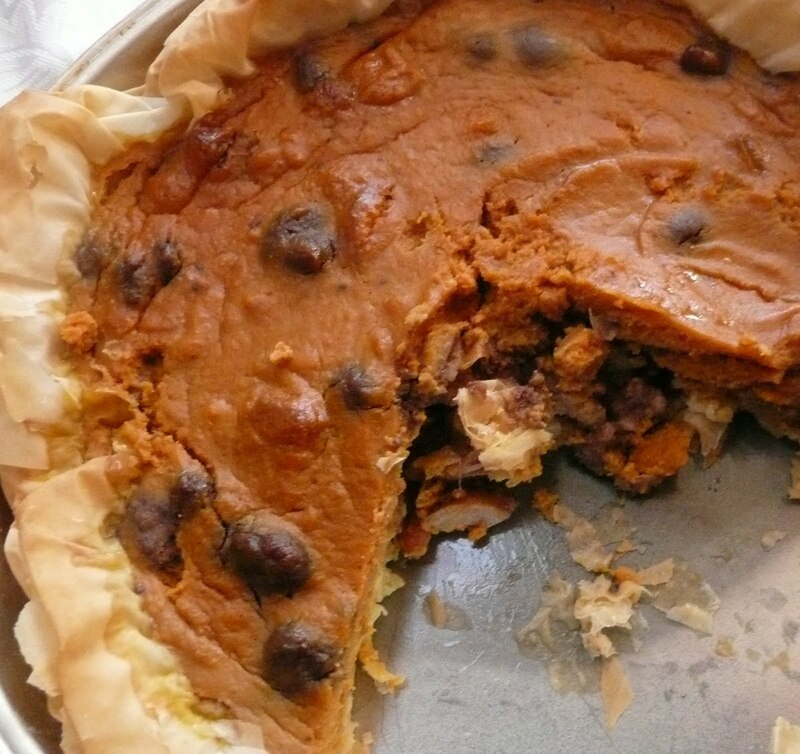 Try this low-fat pumpkin pie variation for all the traditional treat with a bit less of the tricks. For something a bit different, try this pumpkin and date filo tart. It's super easy to make, is non-dairy and is deliciously different than the traditional pumpkin pie. That tart is shown at left. These pumpkin mini-tarts use individual ginger snaps for their crusts and a petite and neat to eat. I used butternut squash when I made this sweet-and-sour cabbage soup, but pumpkin would work just as well. In fact you can use pumpkin pretty much interchangeably with butternut squash in most recipes. Want to learn more about how to select and prepare pumpkins, go to pumpkin boot camp and learn the basics. I've made a lot of sautes using pumpkin or butternut squash. One saute was inspired by what I could find in the farmer's market one winter day. 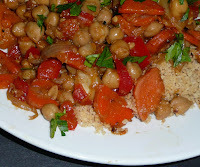 This Moroccan inspired chicken, chickpeas and pumpkin dish (pictured) is great served over couscous. I also have a killer chipotle, pumpkin and turkey chili you should try. 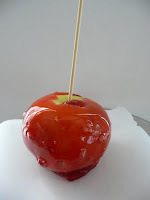 My husband and kids think a caramel apple rules, while an old-fashioned candied apple makes me drool. Unfortunately, most of you agree caramel apples are best. 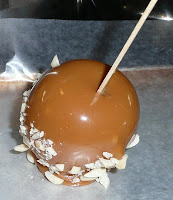 In an informal poll I hosted on Blog Appetit, caramel apples were the clear winner. The caramel apple at left was made according to the directions on the back of a package of Kraft's caramels. My devilishly good candied apples feature the a bit of cinnamon heat from the candies used to give the coating its color and taste. Well, maybe these oven-roasted garlic fries didn't WIN the series for the San Francisco Giants, but they had to help. A riff on the garlic fries served at the Giants' AT&T Park, they were a special request when my guys watched the final game of the National League West division playoffs. 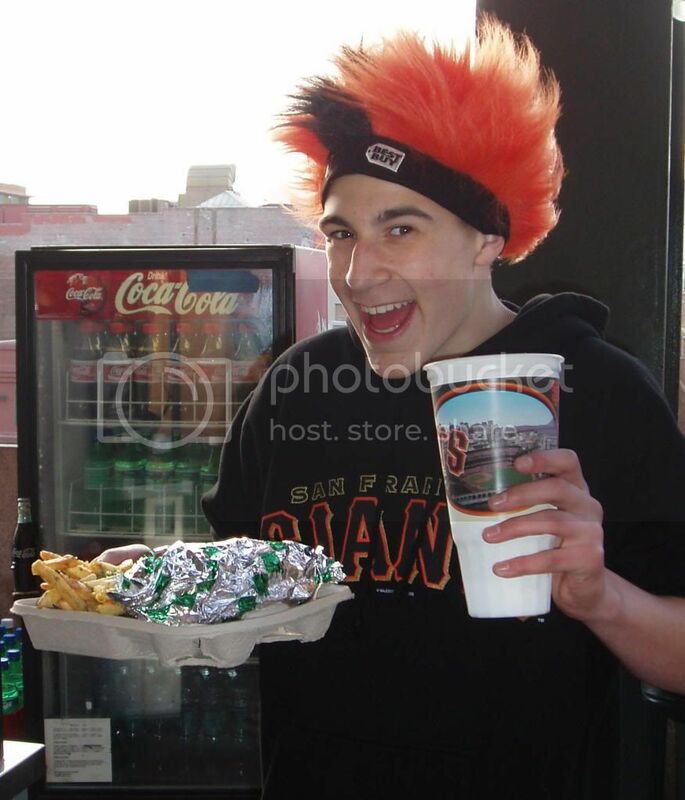 All I know is that my fries were a hit and the Giants won. Guess I'll be making this again for the upcoming league championship series as well. These fries could be called twice-cooked garlic fries. 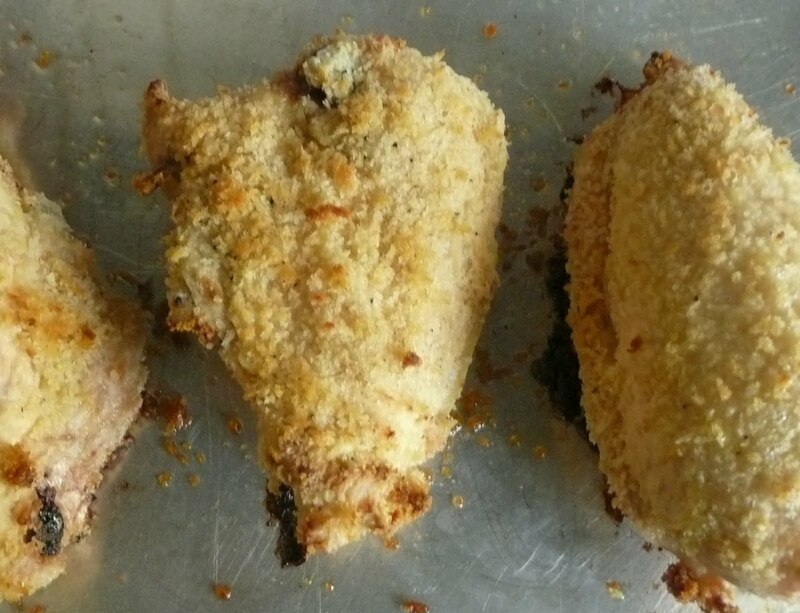 The double cooking gives them a crunchy crust and rustic appeal. Not a garlic fan? Skip the garlic (and parsley if you want), the fries will be almost as good. I leave the peels on the potatoes because we enjoy how the bits and pieces that separate get nice and crunchy. (And speeds preparation time). Feel free to use peeled potatoes if you prefer. Scrub the potatoes, but do not peel. Slice each potato in half so you have two long sections. Slice each of those sections into four long pieces. Boil in salted boiling water until almost tender. Drain well. Don't worry if the potatoes have lost a bit of their shape or the skins have separated. Oil 2 large baking pans or trays. Put 1/2 cup of olive oil in a large bowl, add some salt if desired, and toss with cooked potato. Spread the coated potatoes out in a single layer on the baking trays. Bake in a preheated 475 degree oven, turning occasionally until the potatoes are browned and crisp. (This can take anywhere from 30-50 minutes, so keep a close eye on them.) Remove from oven and while still very hot toss with salt to taste, minced garlic and chopped parsley. It's My Blog-o-versary and I'll Get a New Domain Name if I Want To! Yes, it's been five years since Blog Appetit was launched with its first post (Testing.Testing.). Some things haven't changed, like my commitment to original recipes, food education, celebrating locally sourced food, attempting to grow as a writer and recipe developer, trying to improve my photos, exploring new cuisines, trying to put ethnic food in a cultural or at least personal context and promoting food justice. Another big change is that as of today, I'm publishing at my own custom domain. The new web address is http://www.clickblogappetit.com/. If you link to me over at http://clickblogappetit.blogspot.com/, don't worry, everything should refer. (Please note that since it took me hours and hours today to get this set up right and there have been random glitches, so there is always a chance the domain could end up off line a bit as everything gets jiggered into place. If that happens, check back on the blogspot address until the snafu is corrected.) Just found a glitch -- my blog search isn't functioning correctly yet. Another part of my blog-o-versary celebration is the beginning of a special project about how families and individuals from around the U.S. and elsewhere celebrate Shabbat. If you would like to participate in that, please read this post for more information. 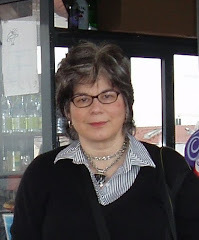 Oh, and a special shout out to my friends from Blogher Food 2010 (particularly Copykat) who convinced me to take a deep breath and get my own domain. Here's a few of my favorite blog posts. Give them a read and let me know what you think. Thanks for clicking in for these past five years. I look forward to many more. 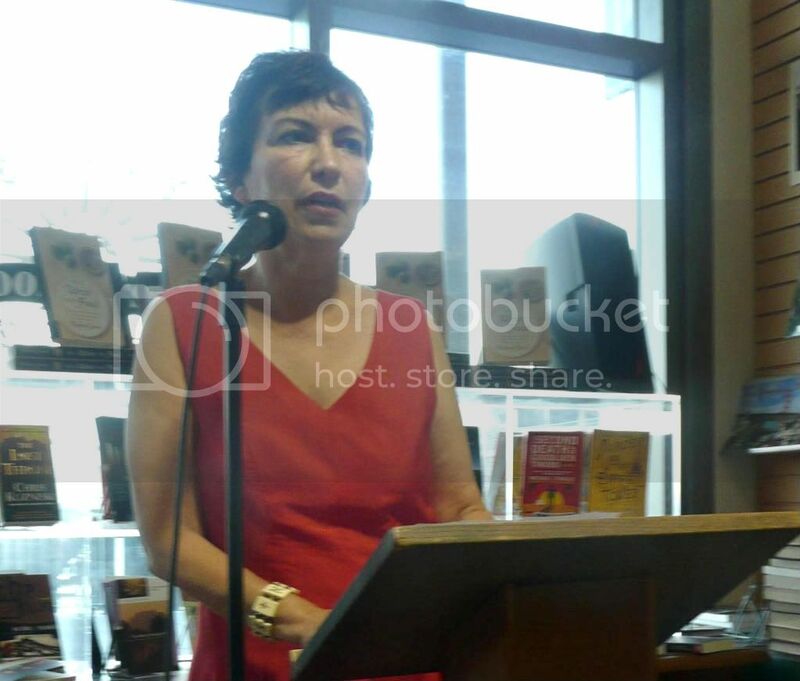 Dianne Jacob, food writing teacher, coach and author, was at San Francisco's Book Passage recently to talk about the new, second edition of her guidebook for food writers: Will Write for Food. 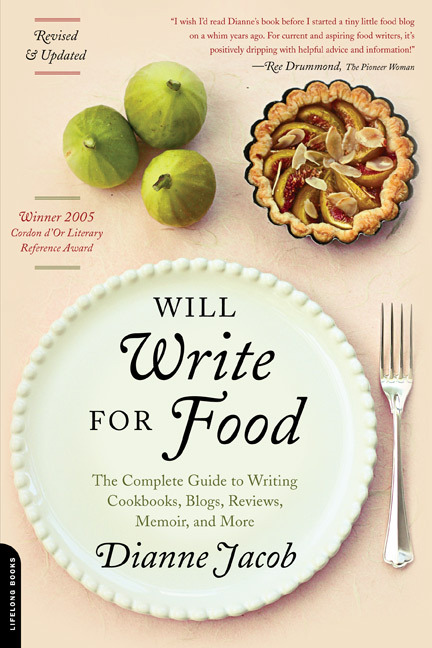 The new edition is subtitled "The Complete Guide to Writing Cookbooks, Blogs, Reviews, Memoir, and More" and is fully updated. It includes information on blogging, electronic publishing and other topics that weren't very mainstream five years ago when the book was first published. Jacob said other topics needed an updating since technology and the changing nature of food media have affected the market for food writing. Here are some points Jacob made at her talk and during the question and answer session afterward. Restaurant reviewing has changed because of sites such as Yelp and Chowhound that allow the customer to review and rate his or her experience. It also widens the kinds of restaurants reviewed since the sites are not just for the trendy or upscale establishments. The reach of blogging can be amazing. In one year of writing her blog, she said the number of page views her food writing blog gets is higher than the circulation of a print magazine she once edited. Freelance writing has changed. There is less demand since many of the traditional sources such as magazines have declined and those that have survived are selling fewer ads so they have fewer pages for editorial. Another trend is to shorter stories. There is also pressure on bloggers to contribute posts and even articles for the "exposure" rather than for pay, which drives down freelance rates. "You can't just want to write a cookbook, you need to have a national platform," Jacob says. While publishers were always interested in cookbook authors that had a built in audience, now it is almost obligatory. A successful blog is one way to build that platform. "You have to become a somebody before you write the book." Cookbook authors need to know how to promote their own work. "Publishers are insisting you are in charge of sales of your book," Jacob says. The bar has been raised for food bloggers. It not just about the food. In addition to strong writing and good recipes, you need to be a photographer, marketer as well as understand a host of technical issues. Print writers have to increase their visibility. Create a blog if you don't already have one. If you have a cookbook out, your blog should mirror that. For more on this topic, check out Jacob's Will Write for Food blog and her website. Going to BlogHer Food 2010? Jacob will be moderating the panel on storytelling. Meals on Wheels organizations from the seven Bay area counties have teamed up with more than 80 partner restaurants to stage the first annual “Bay Area Dine Out for Meals on Wheels” on Tuesday, November 9th. A portion of that evening’s proceeds from participating restaurants will be donated to local Meals on Wheels organizations which are providing nearly three million meals each year to more than 8,500 seniors in daily need of a hot, nutritious meal, a wellness check and companionship. Among the list of participating restaurants is a number in San Francisco and Alameda County that I have been to and enjoy. In San Francisco, these include the Grand Cafe, Gaylord's and The Elite Cafe. You can see the other participating SF restaurants here. In Alameda County, I've eaten at Ajanta, Dopo, Italian Colors and Speisekammer. You can see the complete list here. There are plenty of of other offerings throughout the Bay area. If you know someone who would benefit from being a Meals on Wheels client in the Bay area or elsewhere in the U.S. or would like to support your local area Meals on Wheels, please click here to find an agency near you. Figs. Jammy with just a bit of lemon, vanilla and sugar. Almond paste. Smooth, nutty, slightly sweet and wonderful. Cornmeal and olive oil crust. Crumbly, earthy and a bit hearty. Put these elements together and you have one of the best things I put in my mouth this year. The textures, tastes and just plain deliciousness made one piece not enough, even without the gilding of whipped cream or vanilla bean ice cream. Plus the crust is very easy to mix and just pat into place (no rolling out needed). Oh, and this goodie is vegan. The recipe was developed for my j. weekly column. To read that and to see how it fits into the fall harvest celebration of Sukkot, please go here. Put figs, lemon juice and zest, vanilla and half the sugar in sauce pan over low heat. Cook, stirring occasionally, until thick and jammy, 25-30 minutes. Preheat oven to 425 degrees. Mix flour, cornmeal, salt and remaining sugar in bowl. Stir in oil. Mix thoroughly with hands until dough comes together. Press evenly into bottom and sides of a 9” tart pan. Prick all over with fork. Bake for 15-18 minutes until crust is lightly browned. (If crust puffs up as it cooks, prick again.) Let cool. 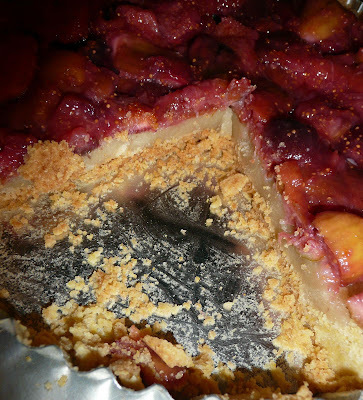 Pat almond paste into bottom of tart. Top with cooked figs. Note: I used Love'n' Bake's almond paste for this recipe and I do recommend it. I have had a long history of using Love'n Bake products (and receiving an occasional sample). Please see my posts on pistachio tart and king cake. There is something about China and the Jews. Maybe it has to something do with a reverence for education, a shared sense of being an outsider, or just the appreciation many U.S. Jews have of growing up eating moo moo gai pan, but the stories of long assimilated Keifeng Jews and the more recent Jewish communities in Harbin and Shanghai attract us as much as the promise of egg fu young or even kung pao chicken. The stories of lives led and a culture lost have an appeal that affects Jews beyond those whose heritage has been touched by these places, which includes communities of Russian Jews who fled pograms and poverty and later the Russian revolution through Siberia and the Trans-Siberian railroad into Harbin, Iraqi and Indian-Iraqi Jews leading what has often been depicted as idealized colonialized life in pre-World War II Shanghai or the grimmer realities of hunger, internment and uncertainity faced by Holocaust refugees in a Shanghai ghetto. Recently at the Jewish Community Center of the East Bay, in Berkeley, CA, Inna Mink and Dianne Jacob got to explore their families' Chinese heritage and food memories and we got a taste literally and figuratively of a lost world, with local restaurants supplying some typical Shanghaiese foods for tasting. The event was co-sponsored by the Asian Culinary Forum. The evening, tied to the closing of the Shanghai exhibit at San Francisco's Asian Art Museum, was supposed to be about food, but as usual it is hard to divorce the food from its place in memory, family, culture, society, economics and identity. Mink's grandparents left the pogroms of Russia for Harbin, what was then essentially a Manchurian Chinese shtel without plumbing or much of anything else. It's only recommendation was that it was not Russia and they felt safe. When Mink was two, her parents thought there would be more economic opportunity in Shanghai and moved 1,000 miles to the south. The lived in the French Concession, an upper class European section of a city divided by race, class and economics thanks to the Opium Wars and its position on the edge of China on the Yangtze River. Mink is a grandmotherly woman who came to the U.S. after WWII, but her face softens, her smile broadens and a playful young woman peeks out from under her auburn bangs when she talks about growing up in Shanghai in general and eating there in particular. "The food was spectacular in Shanghai," she said, almost with a sigh. She and her mother did not cook nor did any in their set. Servants were plentiful. Food in the home was in the Russian style with beef stroganoff and chicken cutlets called kotleta po-kievksy oozing butter. Jewish style food and kosher considerations (such as mixing meat and milk products) were only seen on the table during the High Holidays and Passover. The family was Jewish, ate Russian food and sent Mink to a French school, but even now it is the Chinese part of her life that she feels has shaped her. The food is still compelling and the pull of Chinatowns and Asian restaurants is strong. Food is the only memory from that time she can still taste, but the time and place have marked her and made China part of her heritage. ﻿ Jacob's story differs in many aspects from Mink's. Her family was from a Baghdadi Jewish background. These were Mitzrachi, or Eastern Jews, with roots in Iraq and in India (where many Iraqi Jews settled before they came to Shanghai.) The Iraqi-Indian Iraqi community began settling in Shanghai the later half of the 1800s. By World War II it was made up of about 500 families who developed diverse Jewish organizations as well as built up the famous waterfront Bund and settled in the International concessions. Trade and business had brought them to Shanghai. Orthodox and observant, for them events based in the synagogue and the home were of primary importance, but many went out for drinks, shows and other nightlife. As with Mink, servants ruled the kitchen and most of the Jewish women did not cook. The household cooks made British, Chinese foods, and dishes reflecting the Jews' Iraqi and Indian roots with adaptations for local food ways such as fresh bamboo shoots in the stew and rice flour dumplings instead of semolina. "Usually it was an American breakfast, a British luncheon, an Iraqi-style tea with pastries and fruit and supper was Iraqi or Indian Jewish food," she said. Jacob was born in Canada after her parents had immigrated in 1949, but she grew up in a home that identified strongly as Chinese. Her parents spoke to Jacob and her sister in the Shanghai dialect (or in Arabic), ate with chopsticks and tried to adapt New World ingredients and Chinatown pantry items into the remembered foods of their past and a connection to what had once been their home. Jacobs recalls her mother's version of spaghetti, a dish her mom had never eaten before, made with copious amounts of onions and black pepper and served with grilled chicken livers. Jacobs was in college before she had pasta with meatballs, tomato sauce and basil. She described the dish to her astonished mother who thought the combination totally unappetizing. And once a month the family would eat out at a local Chinese restaurant, where, according to Jacob, Jewish "amnesia" would set in, and the Jewish dietary laws would be forgotten for a taste of the past and a connection with a life and identity they had left behind. Growing up focused on the food of a country half a world away left an impact on Jacob. "I'd say I feel very Asian identified. I'm very comfortable with anything Chinese, particularly food." The families of Mink and Jacob had very different experiences after the Japanese occupied the city in 1937. Jacob's father's family, who had Iraqi citizenship, was considered stateless and was not allowed to work. One uncle made peanut butter and sold it on the street to survive. Her mother's family held British papers and was interned for five years across the river in an encampment in the then rural Pudong area. There was never enough food and what there was often spoiled and full of bugs. As a Russian, Mink's wartime experiences were much less harsh. There were some travel restrictions and shortages of such things as oranges, butter, eggs and gasoline, but they "didn't have to give up much," she said. It was during World War II that the third major group of Jews arrived in Shanghai, refugees from the Holocaust. These were Eastern European Jews many of whom were aided in their flight by visas issued by Japanese and Chinese consular authorities in Poland and Austria. The Japanese eventually moved many of the 20,000 refugees into a three-quarters of a square-mile ghetto in the Honkou district (sometimes spelled Honkow) without first moving out the area's 200,000 Shanghai residents in what already was an overcrowded and run down area. Restrictions on the refugees increased as the war progressed, but the Japanese governor never acceded to the Nazi demands to hand over the Jews. Neither Jacob or Mink had Honkou experiences to share, but several audience members had family members who were restricted to the ghetto and they spoke about the hardships, lack of food and rationing that their loved ones endured. One woman told of how her Austrian grandmother made Viennese pastries and sold them in coffee houses to help provide for her family. China itself seems to appreciate the richness and diversity Jews brought to Shanghai and has restored some buildings important to Jewish heritage including one of the Eastern European Jewish communities' synagogues and put in a Jewish museum. The exhibit is mostly photo and text panels and focuses on the Holocaust refugee experience, though, there is not much tangible evidence of the community itself except for on the second floor where an old sewing machine and other goods left behind by Jewish emigres are displayed. There is almost no Judaica in the temple building, but there was a mezzuah (prayer scroll in a small container) hung on the door frame. When I was there, a young Chinese security guard came up to me, pointed to it with pride and in halting English told me it was something the Jews used to touch when they came into the building. I didn't explain to him that I knew all about these door hangings, I just thanked him. Then I reached up, touched it and kissed my fingers. I remembered that moment the other night as Mink and Jacob were sharing their memories. I remember feeling connected to those Jews so long ago in such an exotic place by the universal Jewish act of touching a mezzuah. As Mink and Jacob talked that memory came back to me and I though maybe for me as well as others the appeal of Jews in China was that even in what to us is an exotic setting we still had that connection of ritual and meaning that we could share, even across time. And for Mink, Jacob and others with Harbin and Shanghai in their past, the food they ate was as an important link to them as any ritual, photograph or memory. It was a way to define their identity. Their lives in China were multicultural and multilingual. (Mink's family spoke Russian, Chinese, English and French. Jacob's family spoke Arabic, English and Chinese.) Perhaps they only became aware of themselves as being an Asian Jew after their families had left China, but it is now a haunting part of who they are. Here are some typical Shanghai recipes for drunken chicken, vegetarian goose and sweet and sour lotus root from the Asian Culinary Forum site. the recipes are by Chef Nei Chia Ji of Jai Yun and were prepared for an event at the Asian Art Museum in conjunction with the culinary forum as part of the programming centered around the museum's Shanghai exhibit. The 1935 menu from Mink's favorite restaurant, Sun Ya, is almost more like an informational brochure about Cantonese food than a menu. Sweet and sour dishes seemed to be fairly popular, including Mandarin fish, called the "famous fish of Shanghai." Since I learned a version of sweet and sour sauce in my Shanghai cooking class and later adapted the recipe for fish, I include that recipe here. The ketchup in the recipe is totally authentic, much to my surprise. I haven’t done the research so I don’t know if sweet and sour sauce began life in this country (perhaps as an adaption of a traditional dish or a unique one based on Western food availability) and migrated there or a traditional one that was adapted as Western ingredients made their way to China. Note: I used a combination of regular white distilled vinegar and Chinese black rice vinegar (I used one third black rice vinegar), which gave the dish a nice taste and toned down the bright red sweet and sour color (as does the soy sauce). You could also try apple cider vinegar instead of the Chinese black rice vinegar or just using all white distilled vinegar. Avoid the Japanese rice vinegars; they are too mild to give the zing we associate with sweet and sour sauce. 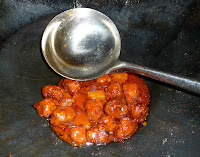 Properly dispose of the oil, leaving about 2 tablespoons in the wok or pan. 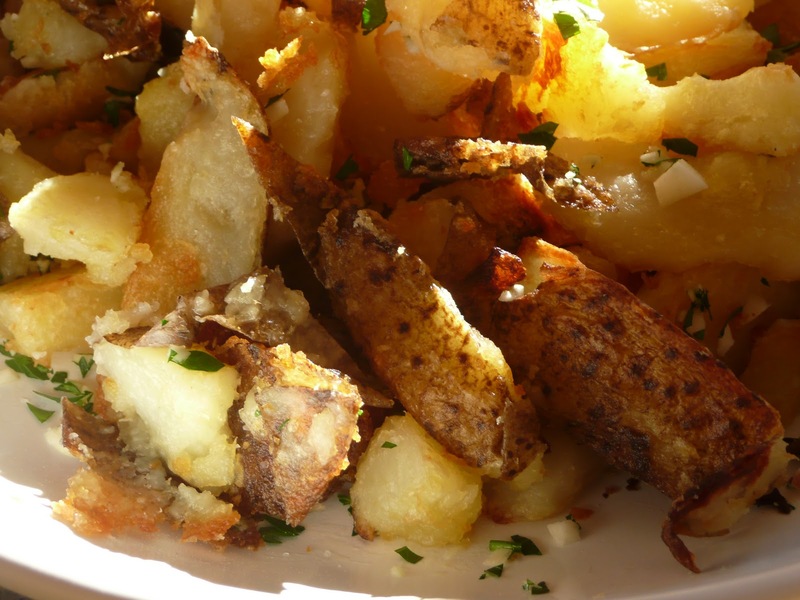 Strain out any left over fried bits with a slotted spoon or skimmer. Heat oil until very hot. Add the garlic and stir fry, being careful not to burn it. Add the scallions and the pepper pieces and stir fry until the pepper pieces begin to soften. Add in reserved sauce and bring to a boil. Slowly drizzle in the cornstarch mixture, stirring until it is well combined and the sauce is thickened. It should still be liquid, but not runny or thick and should coat the back of the spoon. Stir in pineapple chunks and the fish. Mix to evenly distribute sauce. Serve with rice. About the photos: Shanghai and stir fry photos taken by me in 2008.